Michael Jackson’s Alleged Son POSITIVE DNA MATCH… Or so they say… Chances are pretty good that Brandon Howard, 31, is Michael Jackson’s illegitimate son. 99.9% match according to the alleged DNA test. 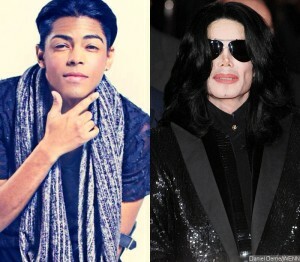 According to the test results obtained by Alki David and his company, filmOn.com, Brandon Howard is almost certainly Michael Jackson son. David told TMZ Live that he received Michael Jackson’s dental impressions from a Beverly Hills Dr that he got from an auction. The impression is 30 years old but David says it’s filled with DNA. Brandon, who now goes by B Howard and looks and acts very much like Michael Jackson, was not present for the unveiling. However David says he had Howard’s DNA and matched it up. David would not reveal which lab performed the DNA testing, but says it showed a clear match. As for B Howard, he’s distancing himself from the whole spectacle insisting he had nothing to do with it.